Your commute stinks. Your job's a mess. You didn't win Powerball. Here's help! 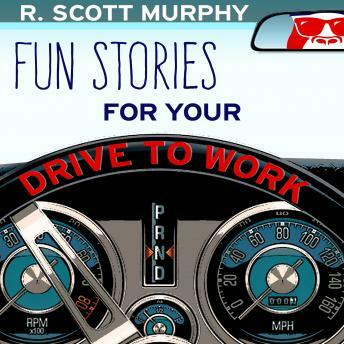 Get the first audio book in the humorous "Fun Stories" series from award-winning writer R. Scott Murphy. Inspired by "Friends," "Seinfeld," "The Office," "Saturday Night Live," and "The Far Side," the Fun Stories series offers amusing audio books, books and CDs to help lighten your day. Part storyteller, part game show host, part DJ, part madcap tour guide, Murphy shares embarrassing work stories, conducts crazy countdowns, sets out on silly Google safaris, and invites your participation through his interactive storytelling game called Mental Kickball. An accomplished radio & TV personality, game show producer, author, and four-time winner of the Late Show With David Letterman Top Ten List Contest, Murphy takes random fun to the next level. TOP FIVE THEATER: Count down the "Top Five Shamefully Suggestive City Names"
MENTAL KICKBALL SURVEY: Is Starbucks more popular than deodorant in your office? IN A WORLD OF SUPERHEROES: Proof positive that Scott is "The Freakin' Michael Phelps of Googling"
Your average daily commute now clocks in at a record 52 minutes (Census Bureau). Your total yearly commute time is now more than nine days. Scott says that's longer than some celebrity marriages. You deserve more smiles. Download Fun Stories For Your Drive To Work today to add some entertainment to the grind of your drive. FUN SIDEBAR: Scott used to think that spirit animal discussions were kind of silly. Now, with the creation of the supercool 800-pound gorilla Mental Kickball logo, Scott sees it as a fun symbol for the collective power of the 140 million US commuters. Unleash your "spirit gorilla" and get more enjoyment in your days. We are Commuter Nation!